Acting Morris County Prosecutor Fredric M. Knapp and Town of Boonton Police Chief David J. Mayhood announce an active investigation into a bank robbery that occurred this morning in the Town of Boonton, New Jersey. At approximately10:08 a.m., a report of a bank robbery was made involving an incident that occurred at the Santander Bank located at 405 Main Street, Boonton. 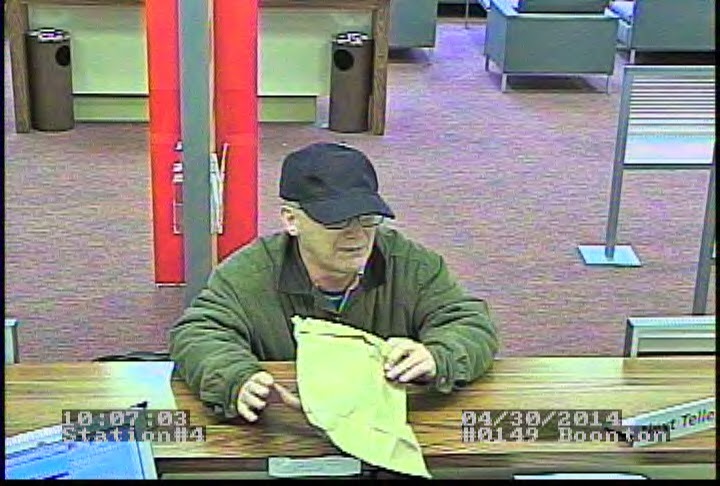 Initial reports indicated that a white male, approximately 5’09”, entered the bank branch and demanded money. He then fled on foot in the direction of Union Street. 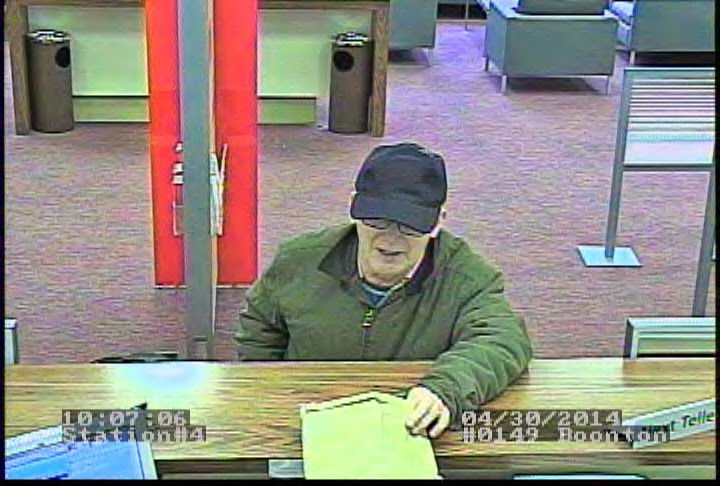 Surveillance footage from the bank revealed several images of the suspect. 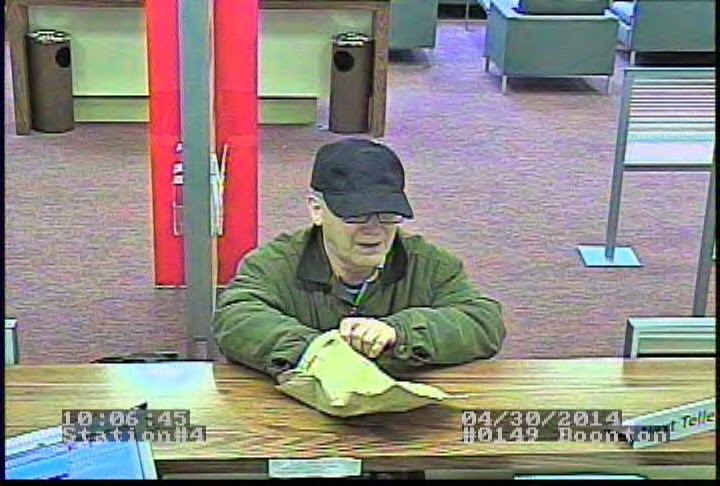 He can be further described as white male wearing glasses, wearing what appears to be a black baseball hat and a green zipper jacket. Numerous law enforcement agencies have responded and are currently investigating, including the Major Crimes Unit of the Morris County Prosecutor’s Office, the Town of Boonton Police Department, the Morris County Sheriff’s Office Criminal Investigation Section and the FBI. Anyone with information about this incident, including the identity of this male, is asked to call the Morris County Prosecutor’s Office at 973-285-6200, the Town of Boonton Police Department at 973-402-9371 or Crimestoppers at 973-267-2255. Acting Morris County Prosecutor Fredric M. Knapp announces that Hope Hezel, 44 years old, of Phillipsburg, New Jersey, has been charged with three counts of Fourth Degree Unlawful Taking of a Conveyance. Between 2010 and 2012, defendant was employed by Morris County as the Director of the Morris Area Paratransit System (MAPS). MAPS is a county-run service which provides transportation to Morris County residents who are 60 or older or 18 or older with a disability. MAPS maintains a fleet of vehicles that are owned by the County of Morris. Those vehicles are used to perform the services that MAPS provides. Hezel was not authorized to use any county-owned vehicle unless directly related to her employment duties and her functions as an employee of Morris County. Defendant allegedly exercised control over three county-vehicles for her own personal use on various dates during the period from 2010 to 2012, although she knew she was not permitted to do so. Hezel allegedly used the vehicles to complete personal errands outside her scheduled hours of employment, and also used the vehicles to travel to personal events, such as a youth sporting event in Pennsylvania. Defendant allegedly took affirmative steps to conceal that the vehicle was county-owned, including affixing a decal to hide the official Morris County seal which was affixed to the motor vehicle. It is also alleged that she attempted to remove a county seal decal. Hezel was charged on April 29, 2014 following an investigation conducted by the Morris County Prosecutor’s Office. The investigation was led by Detective Sasha Gould of the Morris County Prosecutor’s Office. Defendant’s initial court appearance will be scheduled by the court. She was released on her own recognizance. Anyone with information relating to these charges is urged to contact Detective Sasha Gould of the Morris County Prosecutor’s Office Professional Standards Unit at 973-285-6200. Acting Prosecutor Knapp would like to thank the Morris County Prosecutor’s Office Professional Standards Unit whose efforts contributed to this arrest. A criminal complaint is merely an accusation. Despite this accusation, the defendant is presumed innocent unless and until he or she has been proven guilty beyond a reasonable doubt in a court of law. Any inquiries can be directed to First Assistant Morris County Prosecutor/SDAG Thomas Zelante at 973-285-6252 or [email protected]. Acting Morris County Prosecutor Fredric M. Knapp, Morris County Chief of Investigations John R. Speirs, Morris County Sheriff Edward Rochford, Morris Plains Police Chief Scott Thompson, Randolph Township Police Chief David Stokoe, and Mountain Lakes Police Chief Shawn Bennett announce that Operation Take-Back, which was jointly held by their agencies on Saturday, April 26, 2014, was a huge success. Numerous other municipalities in Morris County also independently participated in this national program. Three sites were used for the joint operation, the Randolph Municipal Building, the Mountain Lakes Fire Department, and the Stop and Shop Supermarket at the intersection of Route 10 and Littleton Road in Morris Plains. The three sites received a combined total of 516 pounds of prescription and over-the- counter medications. Morris Plains recovered 222 pounds, Randolph Township recovered 142 pounds, and Mountain Lakes recovered 152 pounds. This is a substantial increase over past years’ collections. In April, 2012, 240 pounds were recovered and in October, 2012, 326 pounds were recovered. In April, 2013, 301 pounds were recovered and in October, 2013, approximately 271 pounds were recovered. Operation Take-Back is a national initiative which encourages individuals to return unused or expired prescriptions, controlled substances and over-the-counter medications for safe disposal. Citizens give their unused medications to law enforcement officials without releasing personal information. The medications are disposed of in an environmentally safe manner. In addition to helping individuals dispose of unused prescription drugs, Operation Take-Back promotes awareness of juvenile prescription drug prevention efforts. Operation Take-Back is a collaborative effort between the New Jersey Office of the Attorney General, New Jersey Division of the Drug Enforcement Administration, New Jersey Prevention Network, New Jersey Chiefs of Police Association, Morris County Sheriff’s Office, Morris Plains Police Department, Randolph Police Department, Mountain Lakes Police Department, Stop and Shop Supermarket, and the Morris County Prosecutor’s Office. Acting Prosecutor Knapp, Chief Speirs, Sheriff Rochford, Chief Thompson, Chief Stokoe, and Chief Bennett thank all members from their respective agencies who took part in Saturday’s operation.